Overnight oats is one of the easiest breakfasts you will ever make. I love easy breakfast ideas. Don’t you? The easiest breakfast you will ever make! In a food processor or blender , grind up the cashews until they are smooth. Combine all the ingredients, including the cashews, in a jar and mix well. Cover jar and set it in the fridge for the night. You can eat the oatmeal cold, or heat it up right before eating. I eat mine cold. I make 5 at a time for easy breakfasts all week. If you use steel cut oats, they will still have a crunch. 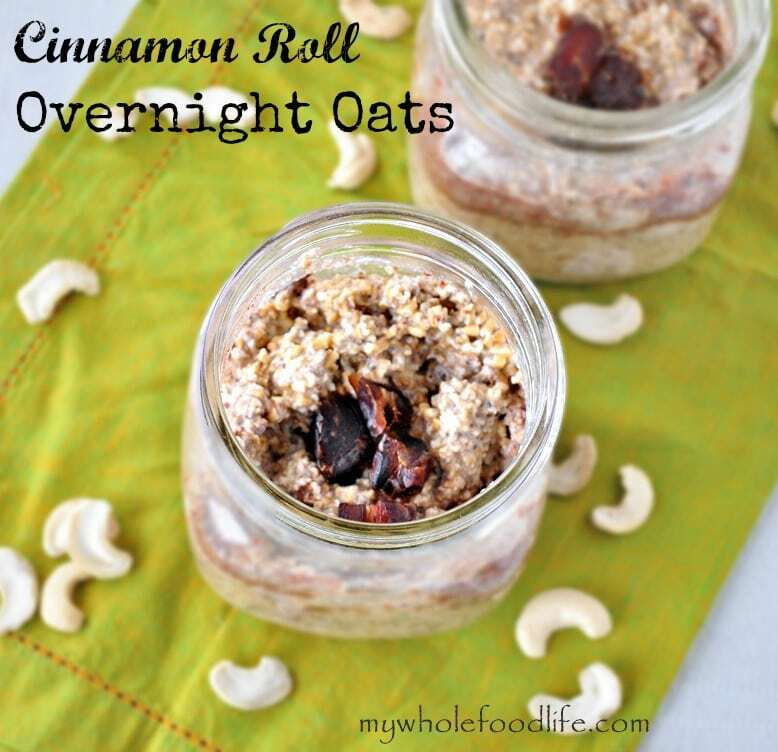 If you use rolled oats, they will be much softer. This recipe calls for a lot of cinnamon because I love it. If you don't like as much of a cinnamon flavor, you can use less. I love over night oatmeal but this is my first attempt at something like this, do I drain the liquid from the cashews before I grind them up? I soak them in water for at least 4 hours to soften them. Before using I drain the water and then grind up the cashews. It makes them extra creamy. If you skipped that part, it would still be good, but less creamy. This might be a stupid question but, are you supposed to combine all ingredients in a food processor, or just the nuts? Just the nuts. Soaking them and then grinding them up gives them a creamier texture. I did the calorie/ nutirtion count on this at myfitness pal, OMG, 550 calories!! I eat mine before I go workout. What did you use as the milk? I use unsweetened milk and that cuts the calories a lot. I also don't add the sweetener to mine anymore. I have learned to eat it without. When I just logged this into myfitnesspal, I got 337 calories per serving. I just had these for breakfast - AMAZING! Love all of your recipes, especially those using oatmeal in different ways. They certainly have helped me make eating breakfast easier and seriously tasty! BTW: big fan of the baked oatmeal too! Thanks! Is there a nut I can use instead of cashew? I do t like them. They really are key to making the "cream." Do you eat yogurt? I think you could sub the cashews with vanilla or plain yogurt with success. I love cold oats but I have a random question. I've read that quinoa can be cooked for breakfast like oats. I've just ran out of oats but have a huge bag of quinoa. Do you think I can make cold quinoa the same way, or will this not work? Maybe I should just test it out. But with less quinoa to milk because it expands? I am not sure quinoa could be made in the same manner, but you can cook quinoa for a hot breakfast. Thanks for your reply. I did look up something to do with my leftover already cooked stuff. Another place mentioned you can mix a little milk and everything else with already cooked quinoa and itll be good for next day like cold oats. So looks like I still have to cook it first! Sorry if someone already asked this... Can you soak the cashews IN the milk and use it all when done soaking? I have never tried. That is a good question though. If you try it, let me know the results! Would it be ok to use frozen banana's to stay overnight in the fridge in the mix? I am not sure. I have never tried. Do u email recipes each day or week? I'd love to be a recipient!!!! If you can somehow make it a liquid you can. I've had my eye on this for a while, but the whole deal with the cashews really turned me off. I hate using appliances because of the work necessary to clean them afterward... Anyway, I finally felt a little adventurous and made these. It was almost a disaster. I do have a little jar attachment for my blender that seemed perfect for blending up one serving of these cashews at a time (to make sure I got the right amount in each container of oats), but all that happened was the cashews got a little ground up and stuck to the sides. I started freaking out before thinking about it. Then I added the almond milk (which was going in there anyway, right, so no big deal!) and was able to successfully puree those stupid nuts! Everything else went great. Other than the resulting oats were a super thick paste. Like spackle. So I ended up adding an extra 1/4 cup milk to give me a more agreeable oatmeal texture (not runny, but something that will obey gravity at least). Very tasty with all that cinnamon! I'm interested in how this would be with some plump, juicy raisins... I'm not sure I'm willing to brave the blender again to try that, though. Thank you so much for the recipe! I'm glad you liked the flavors! :) You can totally add as much milk as you like. I like a thicker oatmeal, so I don't add much.